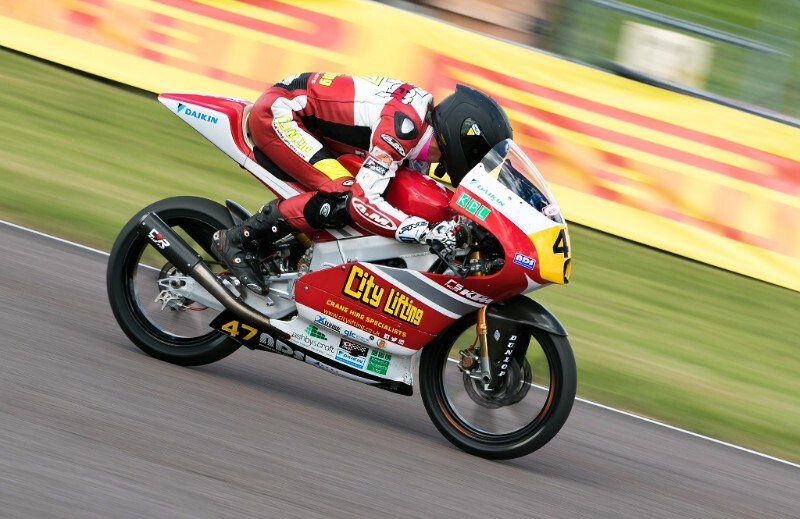 Last weekend, the fast flowing curves of Jake’s home track Thruxton were host to the sixth round of the Hel Performance Motostar Championship, a support series of the British Superbike Championship. The 2.4 mile circuit built on the site of an old World War II airfield is the local track for Andover based Jake Archer, and is one of the fastest circuits on the racing calendar. During near perfect weather conditions the City Lifting Team rider posted the fourth quickest time, in Friday free practice. His time of 1:22.994 was just a tenth off the provisional front row. After some adjustments Jake Archer was out of the blocks quickly in Q1 setting the quickest time early on, on just his fourth lap. Although he was unable to improve further on the time during Q1 he had put himself provisionally on the front row finishing the session with the third quickest time and much closer to the two riders in front of him. On the Saturday morning the riders took part in Q2. Jake Archer quickly set about reducing his lap times and with half the session remaining was sat top of the time sheet with a 1:21.887. In a close fought qualification there were four different riders sat at the top of the time sheet throughout the session. Jake Archer reduced his lap time further to 1:21.723 but missed out on pole position by just 0.150. His lap time placed him third and importantly he would start the race on Saturday afternoon from the front row. Saturday afternoon saw the ten lap sprint race take place. Jake made a terrific start taking the lead into the first few corners. Although he dropped to third place the front three riders were running very close. On the fourth lap there was less than 0.179 seconds between them as they crossed the line. As the race went on the race leader Nesbitt began to ease away as Jake Archer and Mike Brouwers battled for second. This time the Dutch man just edged out Andover’s Archer but he was pleased to be back on the podium after a difficult time at the Snetterton round. The 12 lap second race took place on Sunday afternoon. Archer had a difficult few opening laps as he experienced issues with his gear lever. Once he managed to overcome this he soon set about catching the leading group that were about a second ahead. Although the race leader had begun to edge away Archer caught the group of three in front of him on the seventh lap. In true determined style the City Lifting rider then made an audacious double overtake at the end of lap eight to take him into second position which delighted the local crowd. Archer was then to suffer more problems as just a couple of laps from the end of the race he suffered a mechanical failure in the engine forcing him to retire from the race. A cruel blow after having got himself back into the battle for the podium places. Jake Archer remains second in the Hel Performance Motostar Championship on 139 points.